Camilla Vejen Eriksen is a jewelry artist who lives and works in Denmark. She is a fellow etsy vendor and member of the Starving Jewelry Artists. Her whimsical feminine designs are dreamed of and created in the enchanted Kingdom of Dragonia, where gnomes and fairies rule and Camilla can make magical jewelry all day. I have been lucky enough to watch her talent develop through the posts that we share on the forum. 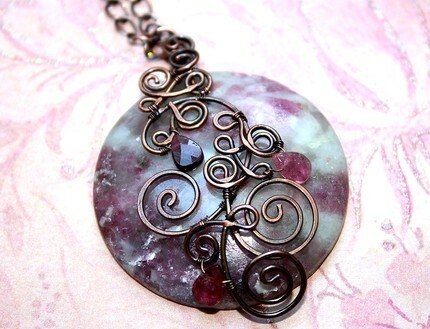 Camilla works with copper wire and gemstones. Her jewelry can be recognized by it's swirls and filigree combining those elements in designs that are both strong and feminine. 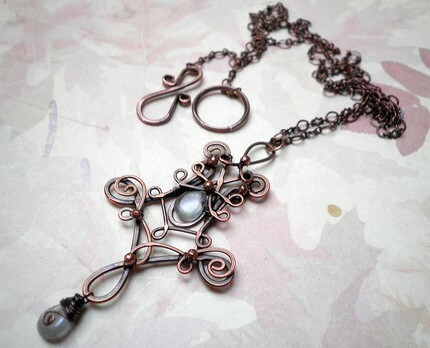 My current favorite piece in Camilla's etsy shop is Fairy Cross. Its delightful spirals, gleaming gems, and deep rich color represent everything that I admire about her work. The story is a bonus. Camilla's description of Fairy Cross begins " Fairies don't have religions like us humans, but they do carry certain symbols for protection and prosperity. This is one of them, I can't write it's name with our alphabet, so I've decided to just call it The Fairy Cross." The name of Camilla's shop is Danagonia - Enchanted Jewelry it can be found at http://www.danagonia.etsy.com/ . It offers fantasy inspired hand crafted jewelry and the tutorials that instruct you how to make some of them.. Her blog can be found at http://www.danagonia-enchanted.blogspot.com/ where you will find the story behind the jewelry and the woman. Camilla comes from a creative family but she is the only jewelry artist among them . Her Mum is the 4th generation, and Camilla is making sure the 5Th generation continues that tradition. I asked Camilla what made her work special? She replied "I try to always leave my mark on my work, so that when people see my jewelry, they instantly know it's mine. Plus I try to write a small story for every piece. Most of the time a little fairytale." When asked about her design process Camilla said "I tend to work from either a stone or certain beads and create my design from that, or I make sketches and work from those. Sometimes I just make random spirals and see what I get." She recently wrote a blog post that shared pictures from her sketchbook. It was a wonderful glimpse into her clever imagination. Beware fairy boys if a fairy girl gives you a birth flower! Thanks so much for featuring me!! Stay tuned for I have asked Bonnie some cool questions, and that interview will be posted on my blog.